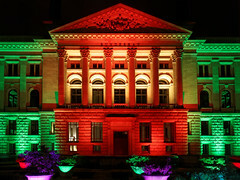 Bundesrat – Festival of Lights by Stadtlichtpunkte, on Flickr. I had decided to stop talking about federalism, for the simple reason that it’s not on offer and is a distraction from the much more urgent independence debate. [Labour leader Ed Miliband’s policy team] are looking at proposals for a radically reformed second chamber made up of representatives from Scotland, Wales, Northern Ireland and the English regions. The body would be “indirectly elected”, possibly by elected politicians from the different nations and regions of the UK. Whereas this proposal would probably be better than the currently unelected mess, it wouldn’t be federalism. Federalism is at heart a symmetrical system (there are some exceptions, such as India, but what I describe here holds true for the best-known examples such as Germany and the US). What this means is that the states (Länder in Germany) all have the same powers, and it’s well-defined which powers are reserved to central government. Countries with federal systems often have a bicameral parliament: One representing the people, with one vote per citizen (e.g., the American House of Representatives and the German Bundestag) and one representing the states (e.g., the Senate and the Bundesrat); the latter sometimes give equal representations to the states (e.g., in the Senate each state has two members), but sometimes big states have slightly more votes (e.g., in the Bundesrat each Land has between 3 and 6 votes, depending on size). Federal countries normally have states that are similar in size, but it’s not a requirement. However, England is huge (53m inhabitants, while the rest of the nations have only about 10m together), and this makes it hard to establish a federal system. Firstly, the English Parliament would be hugely influential — it’s quite possible the best political talents would go there rather than to the UK Parliament, and it’s probably all the BBC would be talking about most of the time. Secondly, a proper federal parliament would allow Scotland, Wales and Northern Ireland to block legislation desired by England. For instance, using the Bundesrat scheme, the three smaller nations would have 3 votes each, so they could easily outvote England (with 6 votes). This is of course where Labour’s devious invention comes into play. By resurrecting the English regions (which aren’t popular in England — let’s not forget how people voted No to regional assemblies when they were asked), they can overcome this problem. By splitting England into nine regions for Senate vote allocation purposes, they can ensure that England will never be outvoted by the small nations of the UK. However, of course Labour aren’t proposing to give the English regions powers like the real nations. There won’t be an East Midlands legal system, there won’t be an independent South West NHS, there won’t be a separate Church of Yorkshire and the Humber, there won’t be a distinct London education system, and the North West won’t start fielding its own football team in international tournaments. The problem is that if there is a debate in Labour’s second chamber about the NHS, for instance, the three nations with their own separate health systems will be outvoted by the nine English regions that not only share an NHS but also have no direct influence over it, given that it’s controlled by Westminster. The only way I can think of to create proper federalism in the UK is to split England into two or more nations, each having the same powers as Scotland. However, this will never happen. The English feel their nation is England, and it would be an abomination to destroy England in order to save the UK. The consequence is that the UK will never become a federal state. It’s impossible. @arcofprosperity Absolutely spot on. No way for an equitable federalism. Totally impossible.